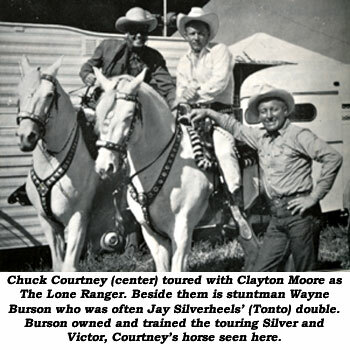 One of the greatest western stuntmen ever is Chuck Courtney born July 23, 1930. Naturally, Chuck was more than capable of doing other kinds of stunts and films besides westerns, as his lengthy resume attests to. To put a face to the name, send your memory back to the “Lone Ranger” TV series for the young and handsome actor portraying the role of the Ranger’s spirited nephew, Dan Reid. 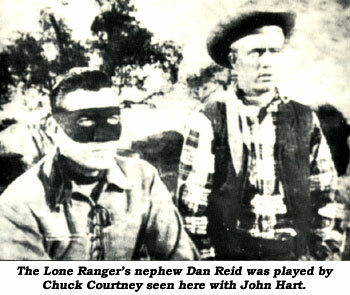 Chuck was Dan Reid in about 14 “Lone Ranger” episodes, performing all his fancy mounts and stunts himself. 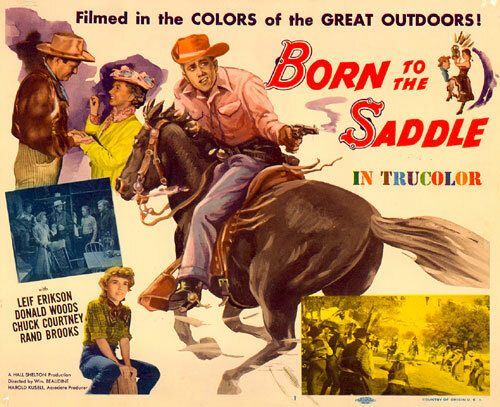 His stunt career spanned nearly four decades with many visible acting credits along the way including lead roles in such fare as “Born To the Saddle” and “Billy the Kid VS Dracula”. Chuck was also featured in “Two Guns and a Badge” and “Cow Country” as well as TV episodes of “26 Men”, “Shotgun Slade”, “Virginian”, “Laramie”, “Rin Tin Tin” and “Jefferson Drum” among others. As with a lot of hard working stuntmen, time eventually comes to branch out into co-ordinating and second unit directing, as Chuck successfully did with such films as “Murph the Surf” (‘74) (which he also co-produced) and the short-lived TV series, “Masquerade” (‘83). In the glory days of western filming Chuck was performing in such films as “Rio Lobo”, “The Cowboys”, “Gumball Rally”, “Santee”, “Peacemaker”, “Stir Crazy”, “El Dorado”, “Warlord”, “Green Berets” and “Flying Leathernecks”, to name only a few. In the early ‘60s Chuck shared his digs with an up and coming western star and excellent stuntman in his own right, Robert Fuller, future star of “Laramie” and “Wagon Train”. The two men became fast friends. It’s only been in recent years the stunt community received any recognition at all, and in August ‘93 Chuck was honored with a Golden Boot Award for excellence in the profession. His friend Robert Fuller spoke for Chuck due to the lingering effects of a stroke Chuck suffered a few years ago. Chuck’s also a lifetime member of the Stuntmen’s Association of Motion Pictures, an honor only given to a few special individuals. One of the true greats in our business died of a self inflicted gunshot January 19, 2000.